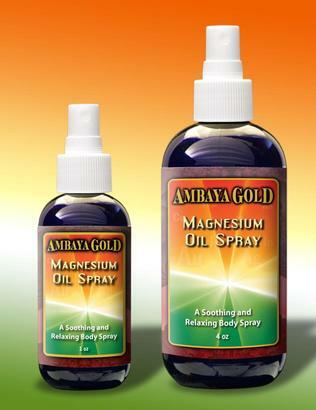 100 Percent Absorbable Magnesium Oil by Ambaya Gold. The pure salt of magnesium enhanced with Ambaya Gold's proprietary fulvic base provides an optimized Magnesium body spray with a high rate of absorption for increased uptake. Suggested Use: 1 spray under each armpit and in the crook of each arm, then gently rub in. Use twice daily. Ingredients: magnesium chloride, fulvic, indium, aloe vera, pyridoxine HCL, methylsulfonymethane, plant based phytonutrients. Magnesium chloride, fulvic, indium, aloe vera, pyridoxine hcl, methylsulfonymethane, plant based phyto-nutrients. 1 spray in the crook of each arm or on each wrist. Use twice daily.